Threat to The Purefoy diminished – for now! You are here:Home » News » Threat to The Purefoy diminished – for now! The immediate threat to the The Purefoy Arms, the 18th century public house and restaurant in Preston Candover, was removed on Wednesday, 10 October when Basingstoke and Deane borough councillors voted unanimously to refuse the planning application from Red Oak Taverns (ROT), which had applied for planning permission to convert part of the premises into separate residential properties for sale. 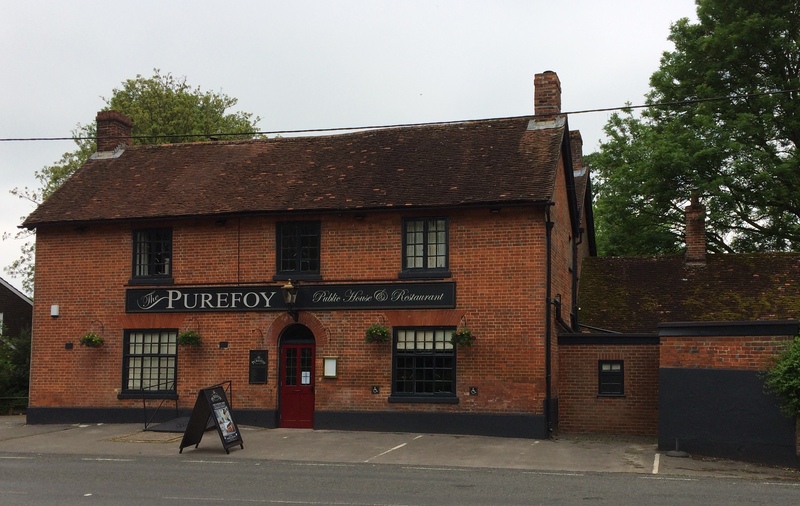 When The Purefoy, a Grade II listed building, closed in October last year many residents feared the worst when the owners, Red Oak Taverns (ROT), applied in December 2017 for planning permission to convert and extend the outbuildings on the north side of the pub into two houses for sale. Local residents feared this would have a profound detrimental effect on the long term viability of the pub and eventually lead to its closure. A campaign initiated by a small group of Preston Candover residents gathered some 120 objections to the planning proposals, but their views were overlooked by Russell Stock, the planning officer, who recommended that ROT’s application should be approved. The rejection of the application by all of the members of the council’s Development Control Committee, in the presence of many Candover residents, means that the immediate threat has been removed, but may not have disappeared completely. ROT has the right to appeal to the Minister, but this could take several months to set in train and, in the meantime, residents hope that Mark Gunnell, the MD of Red Oak Taverns, who was present at the meeting, will accept the invitation to discuss future plans with the community. “ We have won the battle but the war may not be won, Red Oak may appeal; but for now let’s enjoy this moment,” said Jonny Marriott who led the opposition campaign. He thanked Alison Davidson who spoke at the meeting on behalf of the residents “Alison delivered very clear, compelling and astute arguments on our behalf and we are all in awe of your knowledge and your composure Alison, Thank you!! He also thanked Mark Ruffell, the borough councillor for Upton Grey and the Candovers, for speaking at the meeting on the community’s behalf. Red Oak’s plans to convert and extend the outbuildings into two houses for sale would turn the single building of the Purefoy into a terrace of two houses and a pub, and would absorb a large part of the pub’s garden. The full details, plans and elevations, can still be viewed on Basingstoke and Deane BC’s website at https://www.basingstoke.gov.uk/view-planning-applications. The application reference number is 17/03772/FUL . The Purefoy re-opened its doors on 31 May, after an eight-month closure and a major refurbishment and with award-winning chef Gordon Stott, as its new tenant. Jonathan Marriott, said: “We had hoped the investment and the tenancy that Gordon has secured from Red Oak would indicate a change in direction from them, and they had changed their strategy for the Purefoy, and would be satisfied for it to be run as a successful pub and restaurant.” But, the company continued with its planning application. Jonathan Marriott and Steven Hoyle had written a letter on behalf of the objectors to Councillor Paul Miller, the chair of the Development Control Committee, which was also copied to all the members of the Committee. In the letter Jonathan and Stevan emphasised that “An approval will fly in the face of everything that Basingstoke and Deane Borough Council has tried to achieve over the past 30- plus years, to conserve and protect the special characters of both its urban and rural areas. “It beggars belief that anyone with an appreciation of historic buildings and townscapes could come to the conclusion that attaching an alien construction, devoid of any architectural merit, and equal in footprint size, if not larger, to the current public house, would not have an adverse impact! To argue that there is no harm because it is merely a conversion of existing buildings is totally specious as it introduces an entirely different use not just within the curtilage of the property, but attached to it. See the full report of the planning officer, which includes the full text of the objection made by our local councillor, Mark Ruffell, and Jonathan’s and Stevan’s letter to Councillor Paul Miller.